AXIMA Resonance MALDI TOF-TOF Mass Spectrometer is a unique MALDI QIT TOF MS designed for the structural characterization and sequencing of biomolecules - not just mass measurement. Combining the simplicity of MALDI, the power of MSn, and the accuracy and resolution of TOF, the AXIMA Resonance provides researchers a unique solution. 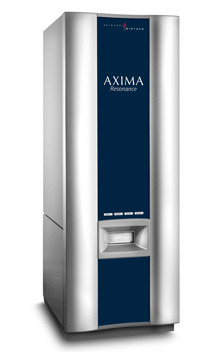 Designed without compromise, the AXIMA Resonance features high mass resolution and mass accuracy across MS and MSn analyses, excellent precursor ion selection, variable energy CID control on the fly and outstanding sensitivity. The unique combination of MALDI and QIT (Quadrupole Ion trap) allows generation of ions using a number of different matrices; switching between positive and negative ionization modes in seconds; simple high resolution precursor ion selection for MSn experiments, and controllableMSn fragmentation. Incorporating a TOF analyzer promotes high resolution and high mass accuracy for all ions generated regardless of their origin. AXIMA Resonance allows ions from complex mixtures or closely associated neighbouring isotopic envelopes to be easily isolated and subsequently fragmented; trapping resolution greater than 1000 FWHM permits analysis of samples with similar nominal mass. Accurate Glycan Analyzer is a software-directed multistage MALDI mass spectrometric approach using the unique MSn capability offered by the AXIMA Resonance and a populated database of real MS and MSn glycan spectra, guiding the user through the process of structural analysis of glycans which are an important aspect in biosimiars. In-Source Decay (ISD) is a widely accepted technique in the sequencing of whole proteins by mass spectrometry, commonly referred to as top-down proteomics. Of particular importance is the characterization of the protein N-terminus. Top-down sequencing using the AXIMA Resonance is achieved by a novel approach combining ISD and pseudo MSn analyses in an ion trap. This has the advantantage of desorbing large proteins and maintaining high resolution on the selection and detection of fragment ions.